This Strawberry Kiwi Cheesecake Salad is the result of me spending hours and hours on Pinterest. Pinterest, btw, is the main reason why I fell in love with cooking after I got married, because of all those delicious looking pins floating around Pinterest. Most of the cheesecake salads I’ve seen on Pinterest feature strawberries, pineapple, blueberries and blackberries. And they all look so epically delicious!!! 1.) 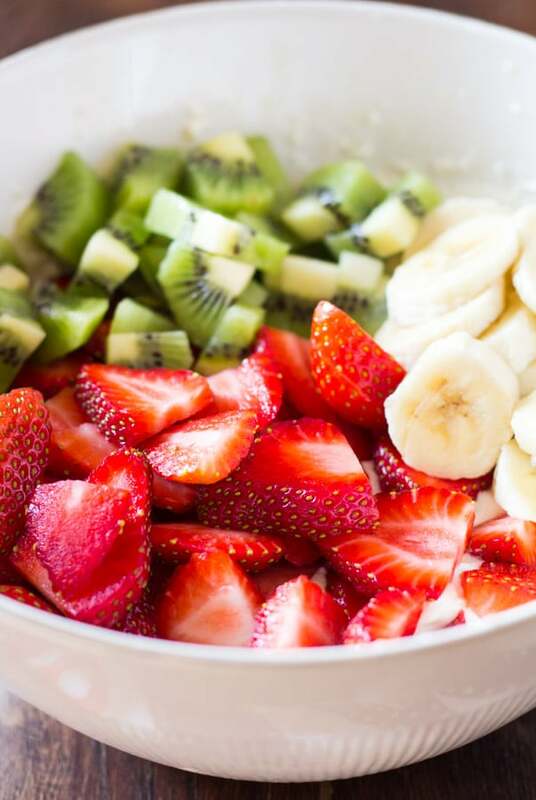 Start by slicing the fruit. I used strawberries, kiwi and bananas. 2.) In a medium sized bowl, beat together the cream cheese, cool whip and sugar until smooth. Be sure to use room temperature cream cheese as it beats smoothly. Also, if you can’t find cool whip you can substitute it with either dream whip, freshly whipped cream or even vanilla flavored yogurt! 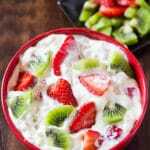 This Strawberry Kiwi Cheesecake Salad is made with fresh strawberries, kiwi and bananas. It's easily whipped up in 10 minutes and is perfect for gatherings! 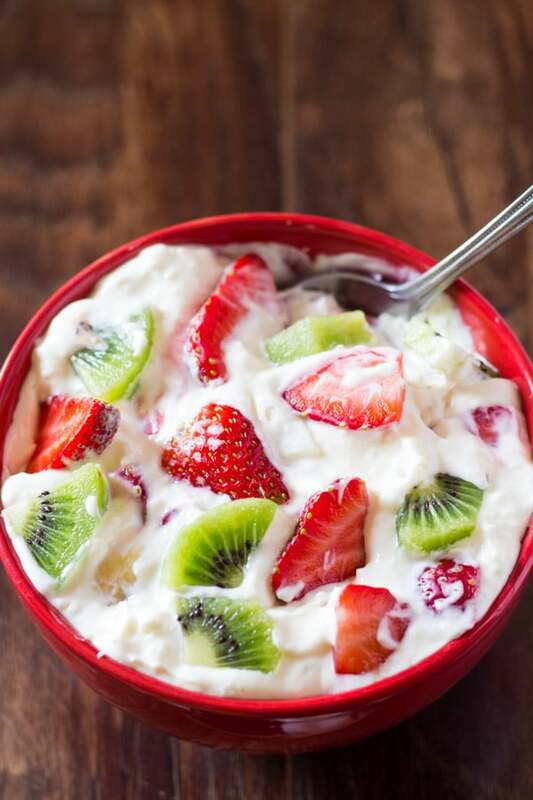 In a large bowl, beat together the cream cheese, cool whip and sugar, until fully combined. 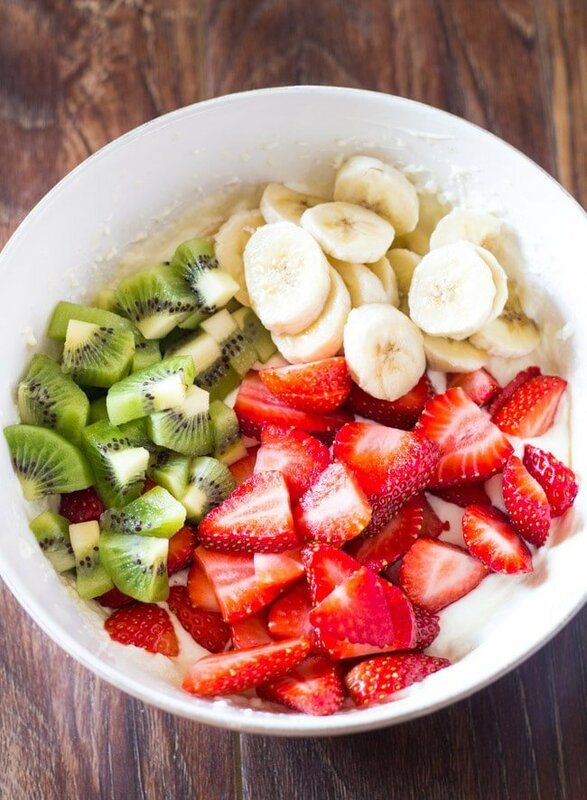 Add the strawberries, kiwi and bananas. Fold carefully into the cream cheese mixture. We are making food day on up coming Sunday And i need to represent such Amazing Dish, I found best recipy.